Sumba is a large island in the East Nusa Tenggara province of east Indonesia. It's 200km long from east to west and 70km at its largest point. 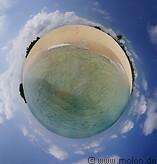 The island is relatively dry and quite flat. It has 660000 inhabitants. 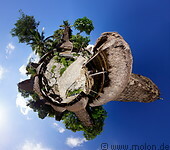 Sumba was inhabited by Melanesian and Austronesian people, but was only colonised by the Dutch towards the end of the 19th century. 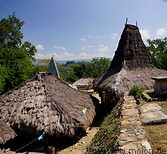 The highlights of Sumba are mainly its traditional villages, with their characteristic thatched and peaked roofs surrounding a central square with stone tombs. The most picturesque village is Ratenggaro on the southweatern coast, where houses surround a central square with stone tombs with the background of the ocean. Sumba is one of the few places in the world in which megalithic burials still take place. Burial in megaliths was practised in many parts of the world during the Neolithic and Bronze Ages, but has survived until today in places like Sumba. The island has two airports, Tambolaka in the west and Waingapu in the east with daily connections to Bali and West Timor. Sumba has a few nice beaches in the south, of which the Marosi beach is the nicest.